Just after getting up this am I decided to wash my camper bedding before I head out for my next major strip segment to CA that will take another 2 weeks. I am already 2 weeks into my 3.5 months trip. Only 3 months to go. My aunt was in the dark as the power was off to her site. I don't desire to get into her business but offered to report the problem to the park. They radio maintenance and the power was on before I made it back to the site walking. The power stayed on for awhile for me to wash and rinse my clothing but not spin it and went out again. My aunt called the office and in a short while the power was back on. A maintenance man came by and explained the electrical system to me. Circuit breaker panel in the park model. Circuit breaker master at front of site. Both I had checked and there was no problem. The problem was in a distribution breaker panel 4 units down. He left and you got it, the power went off again. Off I went armed with the new information about the power distribution breaker panel. Opened the panel door and breaker was not tripped. Ok that's weird. So I decided to cycle the breaker and the breaker rocked back and forth. When this happened the breaker (double breaker) was lifting off the center buss bars and not making contact. Breakers are hooked to the panel Sheetmetal on the side the wires connect and you push the breaker in the posited direction to seat the breaker to the two bus bars. The panel cover provides some stability but not in this case. What was happening was the breaker was not fully seating causing a poor electrical connection. Poor connections are not good under high current. My aunt had the oven on baking. The poor connection with high current draw creates heat at the connection. This heat translates to the breaker and breakers are designed for over current protection. They don't measure current they measure heat. The heat was previously tripping the breaker. 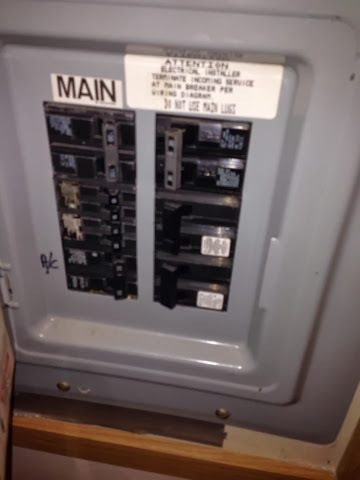 I went to the park maintenance folks and gave them the problem as my aunt and mother are not going to deal with it and maintenance would fix the symtom but most likely would not figure that the breaker needed to be replaced. I had them schedule the replacement for a permanate solution and will not run two major appliances at once until fixed. My aunt was glad I could address before I levels.